If there’s a safety net to investing in blue chip stocks it’s that often your mistakes aren’t quite as bad as they might otherwise be. Take the performance of the oil majors during the ongoing oil price slump for instance. There were a plethora of ways to invest in the oil industry during the boom years following the global financial crisis. Once relatively boring and rarely talked about things like MLPs suddenly had dozens of articles on financial media dedicated to their high yields. Exciting junior E&P companies were popping up all over North America as the shale boom took off along with their stock prices. The AIM small cap market in London was seeing an influx of listings seeking capital for speculative projects in exotic locations. The big oil companies also got their fair share of coverage. Their product was nearing all time highs and the profits followed suit, along with dividends, stock buybacks, their share prices and investor sentiment. The difference is that whilst over-indebted juniors were getting slammed, scrapping dividends and going bust during the oil price crash big oil investors enjoyed a relative safety net. Let’s take a look at a selection of the biggest listed energy stocks: Exxon Mobil, Royal Dutch Shell, Chevron, BP and French giant Total SA. As an investor at the very start of 2014 you’d be looking at Exxon Mobil stock trading at $99.75 with a $2.70 dividend; Royal Dutch Sell ADRs trading at $74.50 with a $3.76 dividend; Chevron stock trading at $124.40 with a $4.21 dividend; BP ADRs trading at $47.85 with a $2.37 dividend; and Total SA ADRs trading at $59.60 with a $3.21 dividend. Imagine you construct a miniature energy portfolio at the start of 2014 containing the big oil stocks. For simplicity’s sake we’ll assume you initiated equal positions of $10,000 in each company. That means that you’d be looking at a yield of roughly 4.20% on your energy portfolio at the start of 2014. Considering these span the gamut of oil & gas operations – from exploration & production all the way to transportation, refining and chemicals – it’s a solid choice. You know that their integrated business models have historically provided significant barriers to entry along with economies of scale advantages. You also know that their relatively strong balance sheets mean that they are much better placed to weather downturns. As time passes on it looks like an inspired choice to construct your new portfolio at the start of the year. By the end of the second quarter many of those positions have appreciated significantly. In addition you would have seen the first dividend payments hit your account with the prospect of many more to come. Then the oil price begins to slip, and over the following months it retreats from a high of $115 a barrel to $70 by November. Suddenly all these traders and financial commentators begin to focus on a single meeting of the OPEC nations. The oil price dives 5% in a single day after that, buffeting your energy portfolio. The following 18 months to date have seen the price continue to slide, hitting a low of $27 in early 2016 before rebounding to the current price of just under $50. Your portfolio looks like it’s been marched down the Grand Canyon and back up again. Amid the volatile share price action you would also notice the following in your energy portfolio over that time frame: Exxon has paid out $7.06 per share in dividends; Royal Dutch Shell has paid out $9.40 per ADR in dividends; Chevron has paid out $10.63 per share in dividends; BP has paid out $5.94 per ADR in dividends; and Total SA has paid out $8.07 per ADR in dividends. Overall you’d be looking at a total of $5,259 in dividend cash sitting in your energy portfolio. Your capital would currently be worth $40,000. So overall, in one of the worst oil price slumps in memory, you’d only be down 9.4%% to date. Pull up Seeking Alpha articles on the oil majors and a huge chunk of them will be dedicated to dividend safety. Here’s the rub as I see it with the big oil companies. Have their historical competitive advantages meant oil majors were better able to maintain dividends in past slumps? Yes. Have their generally superior balance sheets and subsequent flexibility allowed them to smooth volatility this time? Yes. 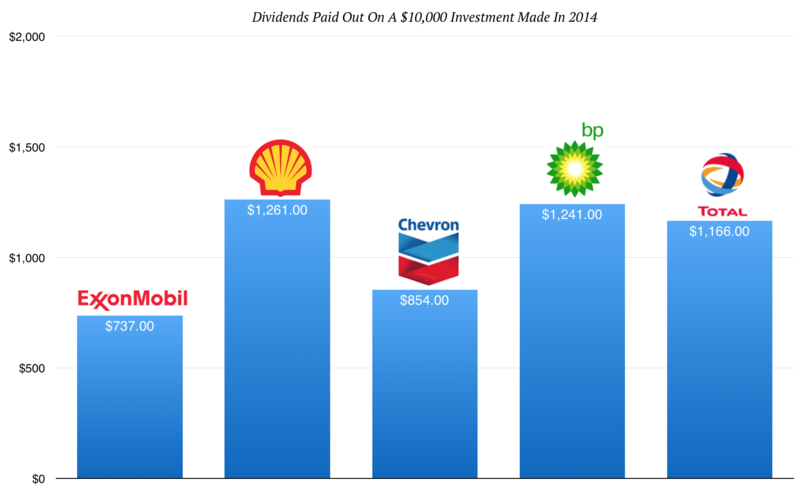 Does that mean big oil dividends can be defended no matter the current oil price environment? No. Could these dividends be cut and the stock prices drop 50% or more? Absolutely, yes. Long-term investing in individual commodities stocks is a rollercoaster ride and nothing is guaranteed with respect to dividends. Look at BHP Billiton as a perfect example of what happens when a dividend gets scrapped and the stock gets battered. But will BHP do better than the majority of its peers over a couple of cycles? I’d say absolutely yes, but by its nature will be brutal with potentially years of it doing not very much at all. Ideally you pick it up when the sector is so reviled because of investor losses that the stock has been crushed and the dividend starts to look pretty nice again as a result. That’s the point where forward returns will be highly attractive. Investing in the energy majors shares similar characteristics. Nobody can really say how long the slump carries on, or what the oil price will look like in one, two or three years from now. The current dividends may not be safe, even for mighty Exxon. Yet over the course of a two or three decade investing horizon it will be these guys that are still around, paying out dividends and probably worth a lot more than they are today.